Has Intelligence Declined in the Modern Era? I mentioned this subject a couple of times before. Simple reaction time data from Woodley et al.Bruce Charlton is the first person I know of to discuss the implications of the change in simple reaction time data in the paper by Woodley et al. 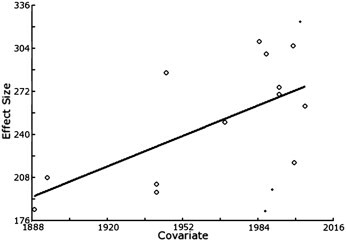 Charlton claims the data shows a 1 standard deviation reduction in IQ based on the correlation [r = .3] between simple reaction time and IQ or the g factor. I remain unconvinced that that intelligence has declined in the last 100 years. For one, that is a terrible fit [see scatterplot]. 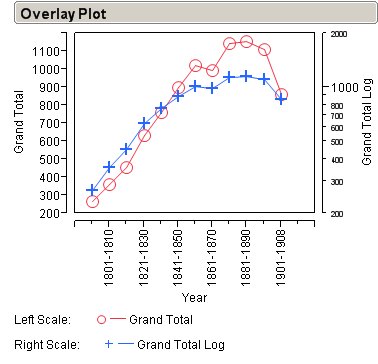 For another, with that kind of correlation, I need better evidence that the model is correct. Charlton's best arguments focus on the way in which intellectual inquiry in general still seems to be dominated by the same famous men of the last century. How do we know that the 500 or so years of the Modern Age are at last drawing to a close? Lukacs's answer to this, and it's a good one, is to draw attention to the remarkable intellectual barrenness of the 20th century. In 1914, when the century began to manifest its characteristic features, the guiding spirits of the time were Freud and Marx and Darwin and Einstein. In 1989, when in a political sense the 20th century was already over, the guiding spirits of the time were Freud and Marx and Darwin and Einstein. There was no other century of modern times that produced so little new intellectual history. Indeed, all but the earliest part of the Middle Ages was livelier. In a general sense, I agree with Charlton that the rate of the big gosh-wow discoveries in science seems to have slowed remarkably. I've come to the same conclusion myself. Where I differ is the cause. It is not apparent that the problem is our minds have gotten weaker. Rather, I think we [we meaning the West] have chosen to focus on other things. The problem is cultural. What I lack here is any sort of quantitative data. My sense is that the tasks to which we apply ourselves have if anything, gotten harder. We just are getting less output partly because our best minds think about other things, and partly because the easy scientific discoveries have already been made. Now if only I could prove it. There is a cracking good discussion of the technical details of the SRT paper over at Greg Cochran and Henry Harpending's blog, West Hunter, that makes some of the same points I want to make here. However, I am more interested in the cultural aspect than the scientific aspect at present. I think we don't make big scientific discoveries anymore because we don't want to. This seems strange, this sort of thing is frequently in the news and a subject of discussion. However, if you look at our priorities as a civilization, we have decided to do other things. You might also say that our civilization is decadent. I use this in the technical sense proposed by Jacques Barzun in From Dawn to Decadence: 500 Years of Western Cultural Life 1500 to the Present 1st (first) edition, a decadent society is one that wills the ends, but not the means. We say we want big science, but we have a remarkably inefficient way of doing it. So what are we interested in? I think the things we are interested in are actually very good things, but they don't produce good headlines. For example, one thing the Victorians were terrible at was industrial hygiene and product safety. A fad for green dye made with arsenic in Victorian England lead to thousands of deaths. The manufacturing process for safety matches produced a condition known as phossy jaw, which could actually make your bones glow in the dark before it killed you. The discovery of radium by Marie Curie lead to the incorporation of radium into a wide variety of products, contaminating much of Paris. It is not very hard to multiply examples like this ad infinitum. The Victorians discovered lots of new things, but they left a lot of collateral damage in their wake in the form of dead and maimed factory workers and widespread environmental pollution. There are now systems in place to verify that products are safe before they enter the market. Designing nearly any product is vastly more complicated now than 100 years ago, not only because science and engineering have progressed and we are pushing the limits of our knowledge, but because you have to make certain every material and manufacturing process you use is safe not only for consumers, but for the workforce that creates it. The big scientific discoveries made life better for everyone on average, and the systems and techniques and regulations we have developed help make sure each individual is able to benefit from that knowledge personally. We have chosen to spend our effort on mitigating the clear downsides of progress, rather than plowing ahead with new discoveries. This dynamic is illustrated by the development policy the Chinese seem to be following: explicitly trading pollution and worker safety for faster progress in order to catch up with the West. A brutal policy, but in fairness to them, didn't we do the same thing, with perhaps a little less self-awareness? The current Western policy is far more boring, even though it probably has greater benefits for the common man. For example, who knows the name of the man who invented the plastic barrels that sit at exit ramps and highway abutments? That man has saved thousands, maybe tens or hundreds of thousands of lives. Preventing something from happening will always be less interesting than making something happen, no matter how useful it is. Yet, our culture happens to promote this. Is that really a bad thing?